Choosing the right home i mprovement company for your specific needs is a very important decision to make. When it comes to roofing and siding, you always have to make sure you’re not only dealing with an insured and licensed company but also someone that shares your vision for your home. Our technicians are fully equipped to repair your leaky or damaged roof and we will also provide you with individualized and customized service for roofs, gutters, and sidings. We provide custom quotes on any roofing, gutter and siding work and follow published vinyl siding costs in online media – being a specialization of ours. With us, you can rest assured that all your needs will be met. From start to finish, we will make it a collaboration so that you don’t feel like you have not control over your own project. After all, it’s your ideas and vision that we will help to make a reality. By choosing us, you are guaranteed to get the highest quality service available at a price that you can afford. 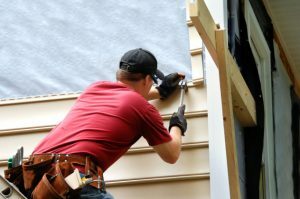 You can also rest assured that your roof and siding will be professionally installed by capable and competent craftsmen. Whether it’s a new construction, improving your siding to cut home heating costs or finally starting that home improvement project that’s long overdue, why not let us make your dream home become a reality.